Visitors to the Grand Canyon often remark on its surreal quality as they fathom its distance from rim to rim, its depth, and its layer upon layer of plateaus and rocky knobs. Capturing it photographically is an elusive task. Mike Buchheit has lived in Grand Canyon National Park for more than two decades as an educator and photographer. His stunning work reflects his patience for the right moment and right lighting as he seeks unusual vantage points and weather phenomena that a non-resident will probably never encounter. The two-person show “Grand Views, Intimate Spaces” showcases Buchheit’s film and digital images, printed on aluminum, a process that intensifies the colors and sharpens the crags and curves of the landscape. Although he gravitates towards sunrises, sunsets and rainbows, the results are less sentimental than that sounds. In “O’Neill Butte Rainbow,” he’s waited for the aftermath of a rainstorm so that he can play up the quality of sunlight shining on certain promontories, as well as the mist falling on more-distant buttes. The double rainbow becomes secondary subject matter. 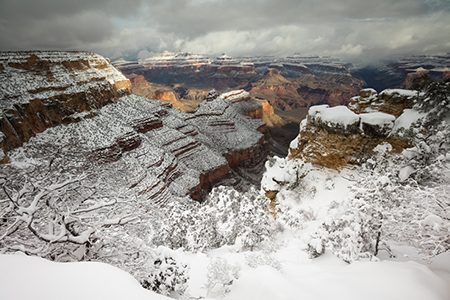 Buchheit’s familiarity with the canyon also leads him to shots such as “South Rim Snowscape,” in which snow accentuates the red layers of the sloping rock faces. Complementing Buchheit's “Grand Views" are Rachel Brace-Stille’s small, square gelatin silver prints of the “Intimate Spaces” of the show’s title. Brace-Stille has regularly visited the canyon for more than two decades, and often accompanies Buchheit on trips into the wilderness. Her close-ups of gnarled wood, desert flora, isolated cairns and bare trees are soft vignettes, gently reminding us to become more deeply acquainted with this hallowed place.